Prima pagina della vita del Bertoni scritta in inglese da P. Joseph Riley. Predicare non alle borse ma alle anime; non alli orecchi, ma al cuore; non per esser lodato, ma per esser seguito; non per tirare a sé, ma a Cristo l?uditorio. (Ms Bg 5667). 1801: Fr. Bertoni preached on the Passion of Christ ? he would use this same sermon again on April 4th, five years later. He stated that Christ suffered in His entire humanity, body and soul. He suffered more than any man could. 1813: Sitientes Saturday ? 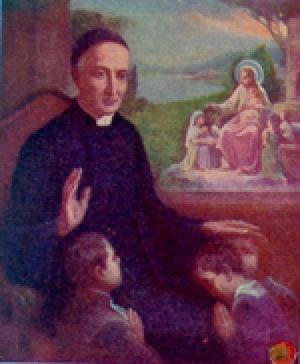 Cajetan Brugnoli was tonsured and received the four Minor Orders. 1825: During these days, the Emperor visited the Stimmate under construction and also St. Teresa?s. This day was Easter Sunday. 1835: Bro. Angelo Casella died today ? he was the first member of the Congregation to die. He was buried in the city cemetery at the ?Pilgrim?s Gate?. It was the 19th year of the Congregation?s establishment. 1838: Bishop Grasser made a Pastoral Visitation at the Stimmate this day. 1867: The students? retreat ended at the Trinita? today. Fr. Lenotti complimented the young boys on their attention and recollection. 1873: Lawyer Brasca wrote this day to Fr. Rigonio, Procurator General of the Congregation, and told him that the government side in the long case seemed to be preparing for a settlement outside of Court. The lawyer suggested that the Congregation accept any offer, as the government might use again Fr. Marani?s ? this was a Report on the Congregation that he had written in which he considered the Decree of Praise tantamount to Papal Approval, which the Congregation at that time had not received] ? and also the fact that the Congregation had acquired property, as at Sale di Povo, which gave every appearance of a legal act, performed by a legal body. 1892: A Memorial Service was held for the recently deceased Fr. Benciolini. The Pastor of St. Stephen?s Church celebrated the Mass - Fr. Zocchi delivered the sermon and told the hearers that in the place of sorrow, there should only be admiration for the holy old man who had just died.